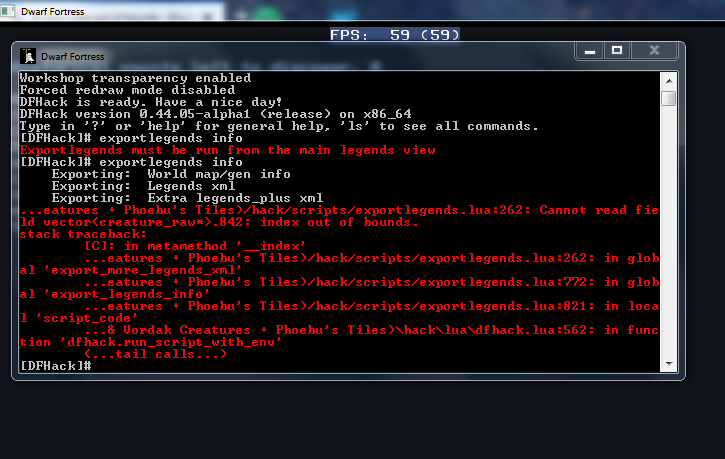 DF Hack Export legends "Index out of bounds" error fix? Can anyone tell me what's going on here and how I could fix this? Re: DF Hack Export legends "Index out of bounds" error fix? I think I did get that when I screwed up compilation of DF + Pheobus tile set + DFHack. One error I made was to have the backup copy of modified creature raws (lowered attack triggers for (semi)megabeasts) retaining a .txt extension, so those raws were essentially read twice. After fixing that I still had trouble, presumably due to failing the tile set introduction, and gave up and decided to wait for the LNP update. The error message itself says that there is a reference in the data to a creature race that doesn't exist in DF, which I think can happen when races are introduced twice. Ahh, yes, this is exactly what has happened, thank you. I checked but, somehow, overlooked a copy of one of the creature files I had edited.